Beetroots or beets are one of creation’s amazing gifts to humankind. Unfortunately, many of us do not like the fruit. This may be due to the fact that we know very little about the richness of this tiny bulb shaped plant. When I was first introduced to it as a young child, there was something about it that put me off. It could have been the smell or the taste I cannot remember but something about it definitely put me off. I hated the fact that mama would make me eat it constantly but not the others and sometimes, naughty as we sometimes are as kids, I would stealthily go behind when she’s not around and throw it away… ah the pranks of kids. Well, they say mothers always know best and I can attest to this truthfulness in many aspects of my life where my mama was concerned including her insistence that I eat beetroots. As an adult, the more I read about the amazing benefits of beetroots, the more I realized how right mama was. Still, there was still that thing about beetroots which continued to put me off. I am no longer that young child who could spoil her face at something truly beneficial as far as her health is concerned due to the taste or smell. 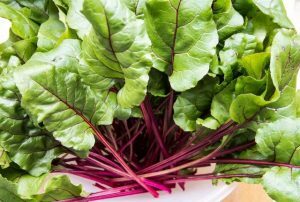 After reading all I could about the benefits of beetroots and how important it is for sickle cell and other health situations, I reckon it would be great to bring it to the warriors. I had to get creative in the kitchen to diverse ways I could enjoy beetroots and get all its earthly goodness. Before I tell you all what my adventures in the kitchen produced, let me talk briefly about the plant itself. The history of beetroots dates back to centuries ago. They were known to grow naturally along coastlines of North Africa, Asia and Europe before spreading to most of the present world. What we know today as beetroots is said to have been first cultivated by the ancient Roman Empire. They contain a lot of health boosting nutrients that we may not be getting elsewhere which makes it imperative to be included in our diet. Beetroots are rich in nutrients and other essential minerals like vitamin C, fibre, potassium, manganese, B folate etc, which makes it a good food for conditions like blood pressure, inflammation, anaemia and so on. It also boosts stamina and is great for detoxification. Natural chemicals called nitrates are also found in beetroots. They produce nitrate acid which helps with blood flow and are also very low in calories. Now, you know a bit about this amazing plant. To know even more, Google beetroots and read about all the amazing things other writers have to say about this amazing fruit. 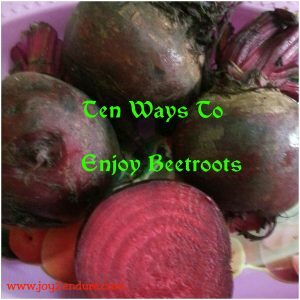 Now that we have established the basics including the nutritional content of beetroot, let’s get to the ten ways we can enjoy beetroot, thanks to my adventures in the kitchen with this unique plant for the past few weeks. 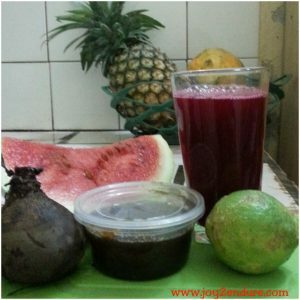 Standard process of making all these different juices with beetroot was to either grate or blend, sieve and if and where need be, add a bit of honey and a cup or half of previously boiled water to extract all the juice or most of the juice from the chaff. So, I introduce to you all what has made me loving and enjoying beetroots and getting all its amazing benefits for the past few weeks. 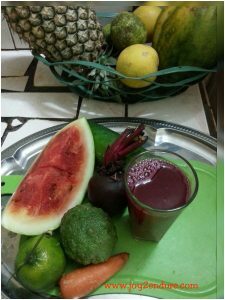 Follow me around the kitchen as I take you through the various mixes and steps of beetroot juice chez Arrey. 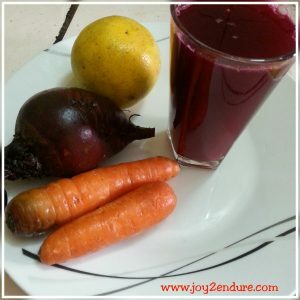 The very first mix I ever did was to try blending together carrots, oranges and beetroots. This is rich and oozing with vitamins. Drinking this mixture regularly left me feeling energetic and great. After drinking this several times, I had to think how to get different mixtures and so, I came up with the second mix. 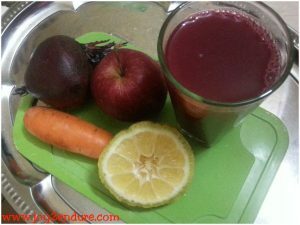 This second mix was made up of beetroots, apple, carrots and lemon. They say an apple a day keeps the doctor away and I say a blend of beetroot and apple keeps Arrey away from the hospitals. Try this sometime for your warrior too. Apples are great too for overall health of all especially warriors. This one was a unique blend of two things known for blood building. 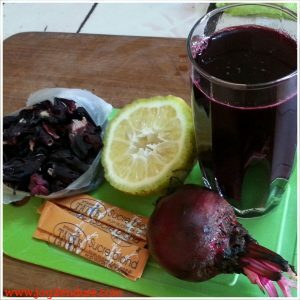 Beetroots, folere (Zobo) and lemon oh the taste is out of this world. The thickness of the red here is testament to the two ingredients. That mean say nor all this red so must gi that blood. J Get your child to get all the goodness of beetroot by mixing it with folere. Almost every child I know loves folere aka small pikin wine. The good news is, the taste of the folere completely masks any trace of beetroot taste but the beetroot adds a unique flavour to the folere drink. Try it and thank me later. So one day I got up and saw pineapple, ginger and lemon in my kitchen and I was like, why not try this mix and see what it looks like and bingo here we are! This was one of my all-time favourites. The ginger flavour adds a tangy taste to the drink which leaves you smacking your lips again and again as you drink. And the good thing is ginger is known for its medicinal properties so in all, this mix is a strong win. The next on the list was a mix of watermelon, beetroot, lemon and honey. Watermelon is one of my weaknesses where fruits are concerned therefore, I had to try and see how it goes with this favourite fruit of mine and oh my, it was simply amazing! The honey added a special taste to the overall mixture and I had a great time drinking it. 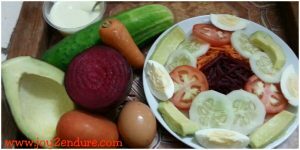 After drinking juice for many days and weeks, I had to try munching and so I set out to make this simple but palatable plate of salad with beetroot, carrots, cucumber, avocado and eggs. With a sprinkle of salad dressing, I had a field day downing it with fresh soft bread from the bakery. Made my breakfast and kept me really full for the better part of the day. With so much tropical delights around me, I decided to do a blend of all the fruits I have used so far. And so, with watermelon, pineapple, carrots, apple, beetroots, lemon, orange, ginger and a teaspoon of honey, I came out with this mix. Oh my! I could feel my taste buds singing kumbaya with all the tastes from these tropical delights in one glass. The ginger also brought in its tanginess and truly, it was a taste to behold. 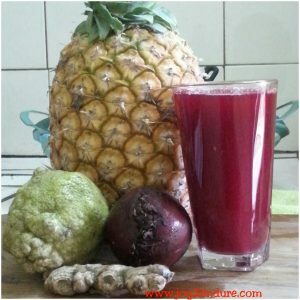 I called it my Beetroot Tropical Cocktail blend. Its exotic taste is truly a testament to the unique richness of the tropical fruit world. I think I am going to patent this mix :). Due to the tanginess of the ginger, a drop of honey was necessary for me, however, it can be drunk like that as well without the honey. 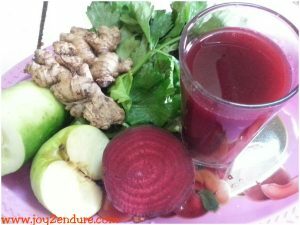 This mixture made up of celery, cucumber, ginger, apple and beetroot tasted like medicine. The taste was bland I think due to the celery and cucumber. A little honey did the trick for me and I could enjoy it. But I must admit, it wasn’t amongst my favourites though a little research showed that this particular mixture could be great for people with high blood because all the ingredients listed above are said to be good for high blood patients. The more I experimented in my small kitchen lab with beetroot, the more the ideas kept coming in. 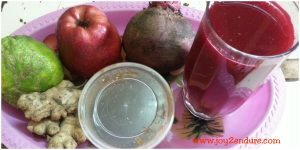 It is for this reason that I could try blending ginger, apple, beetroot, lemon and honey and it was also equally very rich both in taste and bursting with vitamins. And finally, when I went to the market one day, I saw tangerine and I was like bingo! Another fruit to try. Beetroots, watermelon, cucumber, tangerine, carrots and lemon gave me this unique taste. It was so great that no sweetener was needed. It turns out that the mixture of all the above fruits were good for detoxing the system. Add a little colour and taste to your detoxifying drink and gain a little more vitamins and essential nutrients in the bargain. Little by little, these experiments helped me come out with 10 amazing ways one can enjoy beetroots. 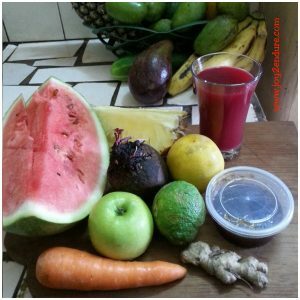 In all the above, unless you are allergic to beetroots, I am sure at least one of the mixes above would inspire you to try it out for yourself or your warrior child. Get a little fun and creative in the kitchen and explore the richness in the world of beetroots. A lot of us know much about the fruit as food but very little about the leaves. I didn’t know either until one of the blog readers asked if she can eat the leaves. That question sent me to do more research and how amazing to find out the leaves are actually edible and even richer. Unfortunately, because many do not know about the benefits of the leaves, it was very difficult to find them in the market. When I do, I would put on my experimental coat and hit the lab of my kitchen to try it out and give you all feedback. In the meantime, like I said, Google can help you discover more about this amazing plant and it’s even more amazing leaves and add these to the many ways you can build your blood or your warrior’s blood naturally. Thank you very much Sis Maureen, Lol Pray you don’t go back to coca cola. Thank you for constantly cheering. Will sure give all these a try Arrey. Thanks for sharing. Thank you Sis Helen and thank you for stopping by. Will be glad to hear your feedback after you try. Yes, mums are like that while we get lazy lol. Glad these recipes give you ideas to not let that happen again.